Our University of Glasgow intern Nicola MacRae talks about her work cataloguing the George and Cordelia Oliver Archive. My name is Nicola and I’m a student at The University of Glasgow on the Information Management and Preservation (Digital/Archives Records Management) MSc. course. I’m currently undertaking an internship at The Glasgow School of Art which has been offered through Glasgow University’s Internship Hub Placement Scheme. This will provide me with the opportunity to develop the cataloguing skills I have gained through the course, as well as give me valuable practical experience of working in archives and collections. The placement involves working with the George and Cordelia Oliver Archive. Tasks to be undertaken include: cataloguing, rehousing, possibly some digitisation, and the opportunity to a run workshop. The George and Cordelia Oliver collection is the personal archive of art critic Cordelia Oliver (1924-2009) and her husband the photographer and writer George Oliver (1920-1990). The collection has been housed at The Glasgow School of Art since its donation in 2008 and is currently undergoing cataloguing. Comprising of news cuttings, photographs and personal papers, it is a rich, untapped resource documenting the changing face of Glasgow from the late 1940s to the 1990s and serves as a narrative on Glasgow’s art scene over the same period. The collection will not only appeal to those with an interest in Cordelia’s writing, but also to a much wider audience as George’s photographs cover a broad range of subjects including: Glasgow’s buildings and people, art works and performance of The Third Eye Centre, Scotland in general, exhibitions, festivals, theatre and cars. As well as her writing and reviews, Cordelia was recognised for her paintings, however, her work as a commercial illustrator is also worthy of recognition and examples of such are to be found in the collection. Collected posters of exhibitions, events and performances also make up the collection and are also of interest as they are representative of Glasgow’s rich cultural history. After an initial appraisal of the collection and organising the material into newspapers, photographs and personal papers, I began to catalogue the photographs. This is a wonderful collection as George was a prolific photographer and it is no surprise that these are the bulk of the collection with, as an approximate estimate, around 1000 items. At this stage, cataloguing the photographs to item level is in the distant future, however, I have begun to catalogue to file level, maintaining George’s original order. I’m very much enjoying this task and learning a great deal from it, not only in terms of cataloguing, but also in terms of Glasgow and its transformation during the 20th century. Areas such as the Gorbals and Clydebank have changed almost beyond recognition and many of the photographs in this collection document their transformation. Buildings such as St Enoch Station and Hotel which have long disappeared live on and are preserved in this collection. When photographing buildings, George often also captured the cars that were in the vicinity. As an aficionado of cars, it is of no surprise that George would do this, he himself being an owner of a Rolls Royce. One photograph that stands out bringing together his love of cars and Glasgow street scenes can be seen below. It depicts his beloved Rolls Royce contrasted with a backdrop of Gorbals tenements crumbling behind. The Gorbals is particularly well represented with depictions of the tenements, their demolition and their high-rise replacements. The photographs are an important record of these high-rises as they have recently been demolished. There is increasing interest in the architecture of buildings of this type and their social context. These photographs will be a fruitful source for researchers with interests in this style of architecture and those with an interest in social history. It is said that people make Glasgow and George’s photographs of Glasgow people certainly emphasis this. Shots of the Barrowlands and Paddy’s Market are fascinating and capture their energy and unique characters. The photographs will bring back memories for those with long connections to Glasgow but will also inform those without such of the drastic changes that the city underwent during the mid-20th century, becoming the place that we recognise today. Performers in action is another subject that fascinated George. A few examples that stand out are of Duke Ellington performing at Glasgow’s Apollo in 1973, Billy Connelly at The Third Eye Centre and Vladimir Ashkenazy rehearsing at Stirling’s MacRobert Arts Centre. Glasgow is not the only place in Scotland to be photographed. Edinburgh, Stirling, Crieff, Culross, Inverness, Bo’ness and Aberdeenshire are represented along with many other places. In contrast with cityscapes and street scenes, the landscapes of Scotland are represented. Street scenes and landscapes of Romania also make an appearance documenting the Oliver’s road trip to Romania in 1971. This trip was made upon the suggestion of Richard Demarco and its purpose was to speak to the artists that were to feature in an exhibition of Romanian art in Edinburgh organised by Demarco. 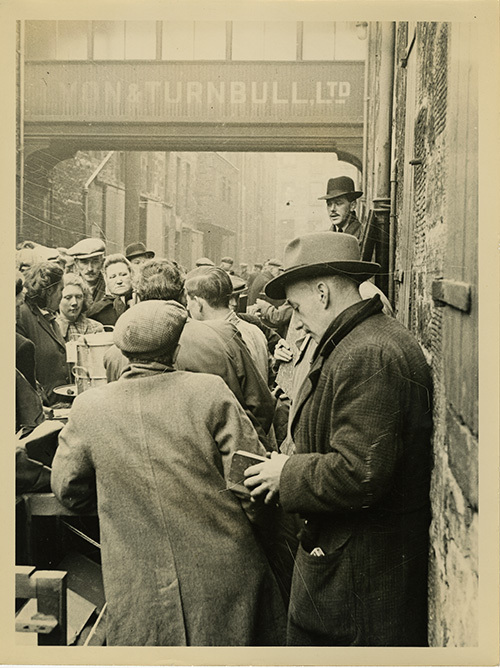 Photographs play an essential role in recording the culture, events, places and people of the 20th century and the photograph collection of George Oliver is one such example. Hopefully this blog post has served as an introduction to the collection and has given a taster of what delights there are to be found within it.